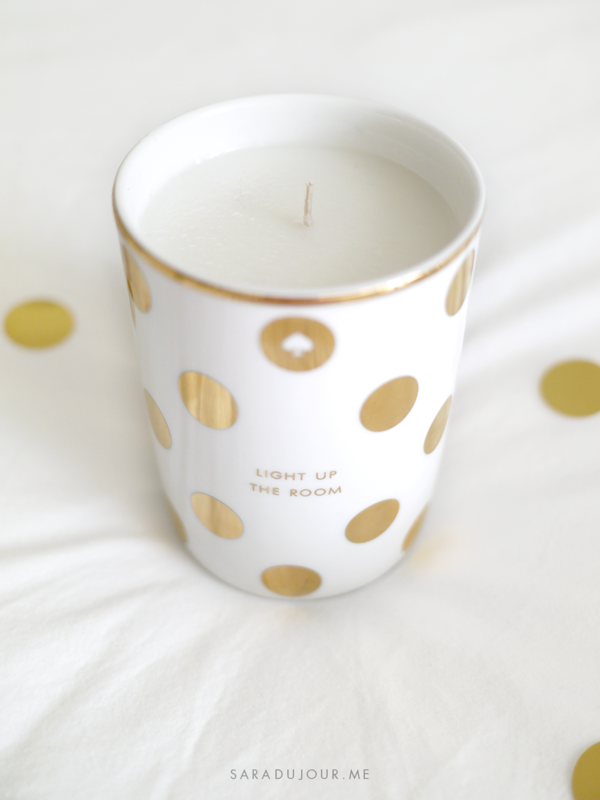 If you’ve been following my blog or Instagram for a while, you know all about my love affair with Kate Spade, and things with gold dots. Naturally, so do my friends and family. Which is why when it came time for my birthday and Christmas gift giving, it was a very Kate Spade haul-iday for me – which I couldn’t be more pleased about. This is a collective haul spanning the last few months, of a few items I bought for myself, and Kate Spade birthday gifts and Christmas presents from the people closest to me. 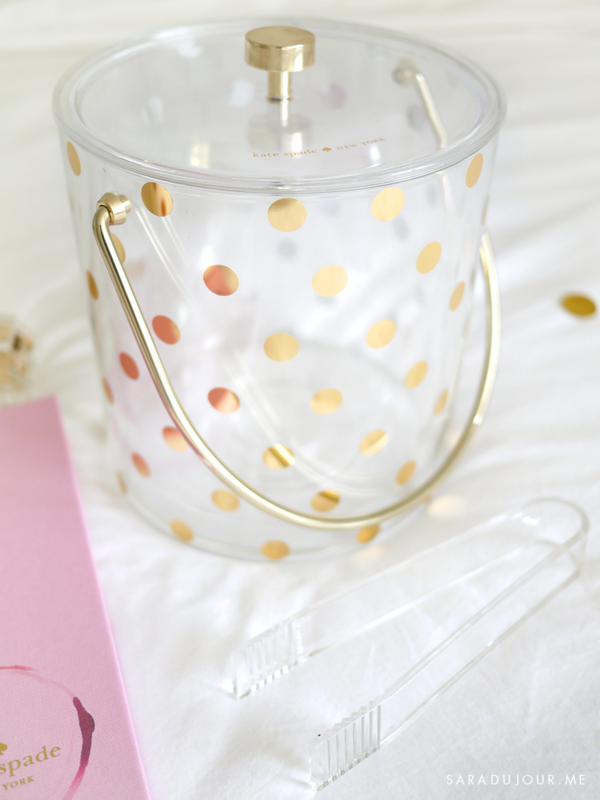 I’m a bit delayed in hauling this Kate Spade acrylic gold dot ice bucket, but you may have already seen it in my Bar Cart Essentials post. This was a lovely gift that I was allowed to unwrap early so I could use it for holiday entertaining. 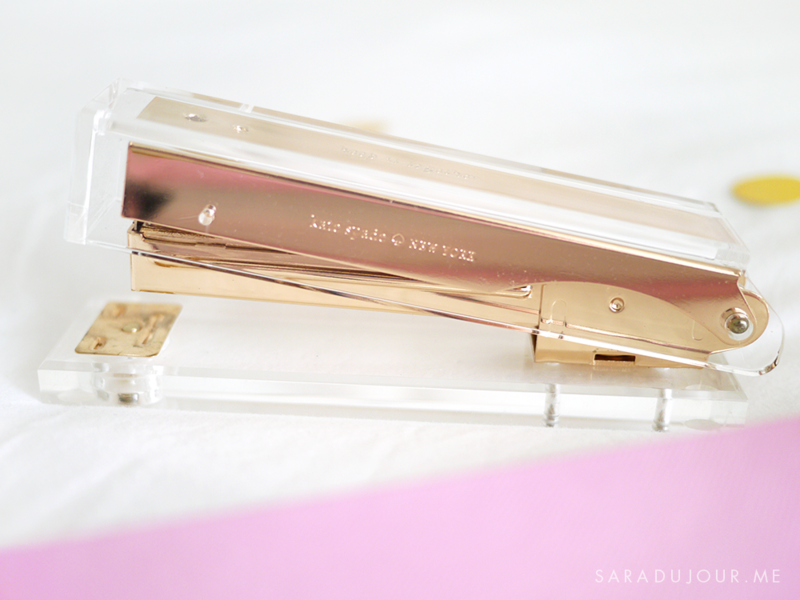 This gorgeous gold and acrylic stapler was another Kate Spade item I’d had my eye on for a while, but very fortunately it came to me as a surprise for my birthday! The top of it has “keep it together” engraved, which I think is so cute. 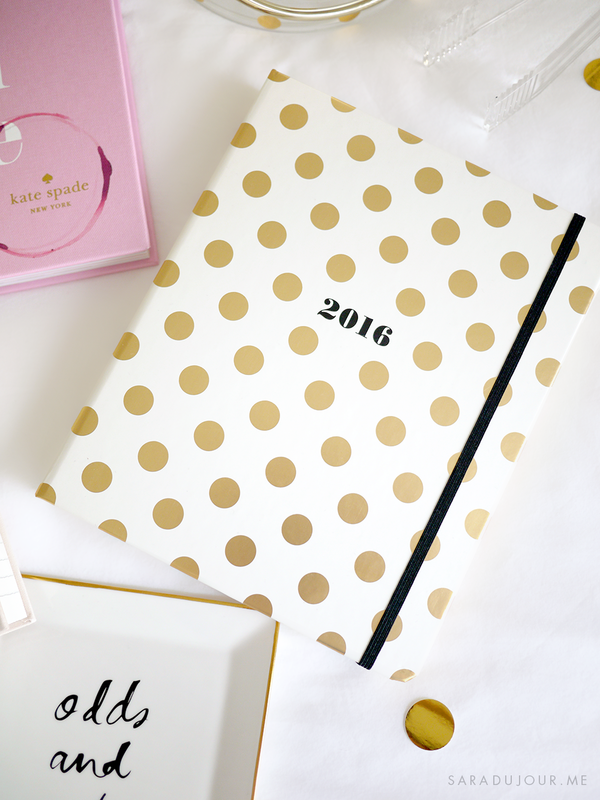 I used this exact Kate Spade large gold dot agenda throughout 2015 to record major (and minor) events that happened day-to-day. I’m not great at committing to proper journaling, so having a little box to record one or two things a day suits me perfectly. I put the 2016 version on my Christmas wish list, and was lucky enough to get it. It spans 17 months and is really beautifully designed and organized. I chose this Kate Spade “Odds and Ends” gold rim ceramic dish for myself, which sometimes keeps my mail organized on my counter, and other times serves as a pretty dish to host lime wedges on my bar cart. 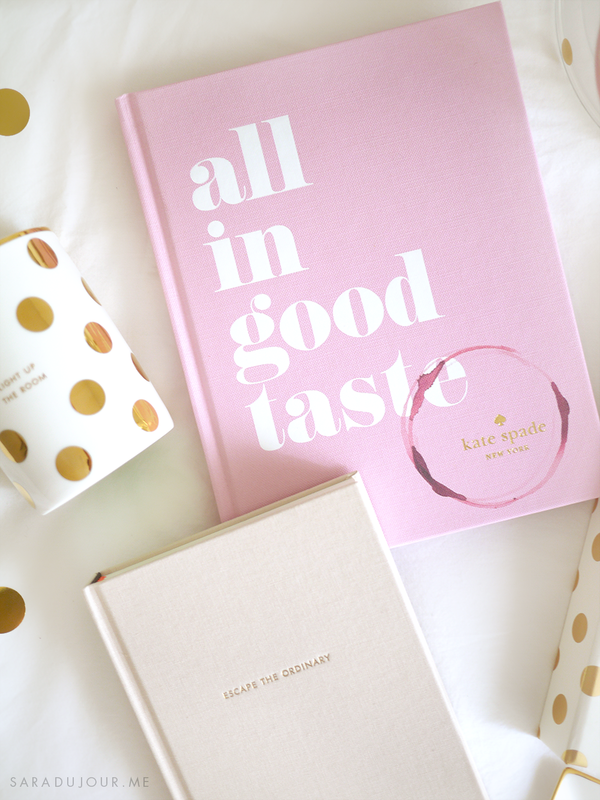 This Kate Spade All In Good Taste book was also something I picked out for myself, to put on my coffee table. It has all kinds of tips, from hosting the perfect party, to personal essays, recipes, and style guides. What I like best about it is how beautifully each page is designed, featuring bold typography and gorgeous illustrations. 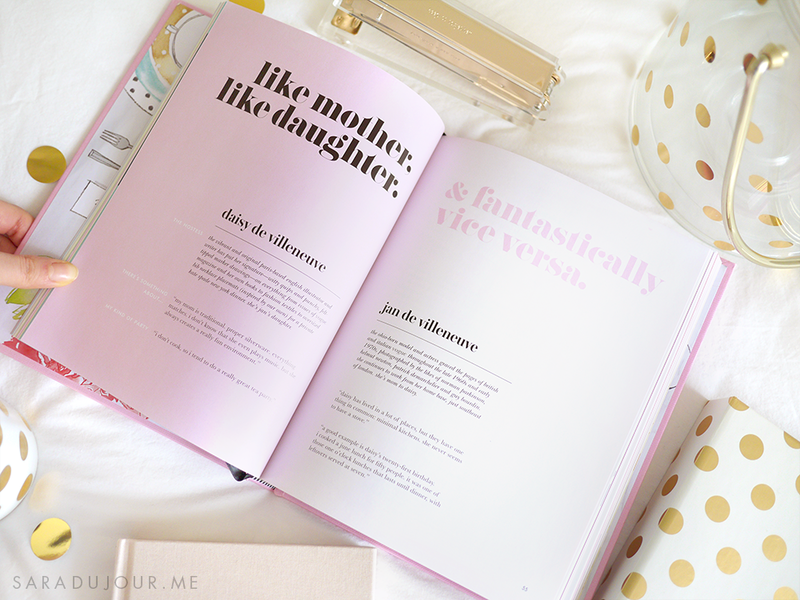 It makes for a great coffee table book because it’s a light read that’s fun to flip through. 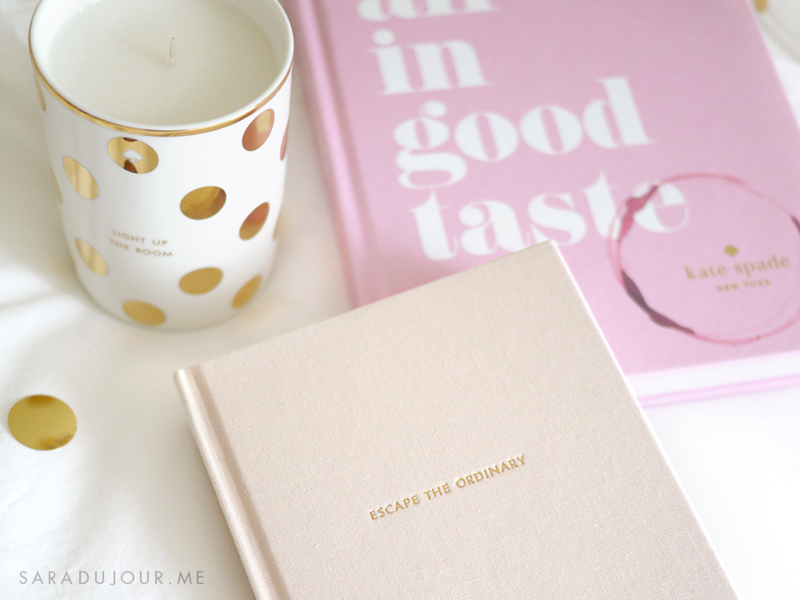 My best friend surprised me with this blush pink “Escape the Ordinary” hardcover lined journal as one of her birthday gifts to me. The inside cover has gold dots, which is why she knew I would love it. (I do!) 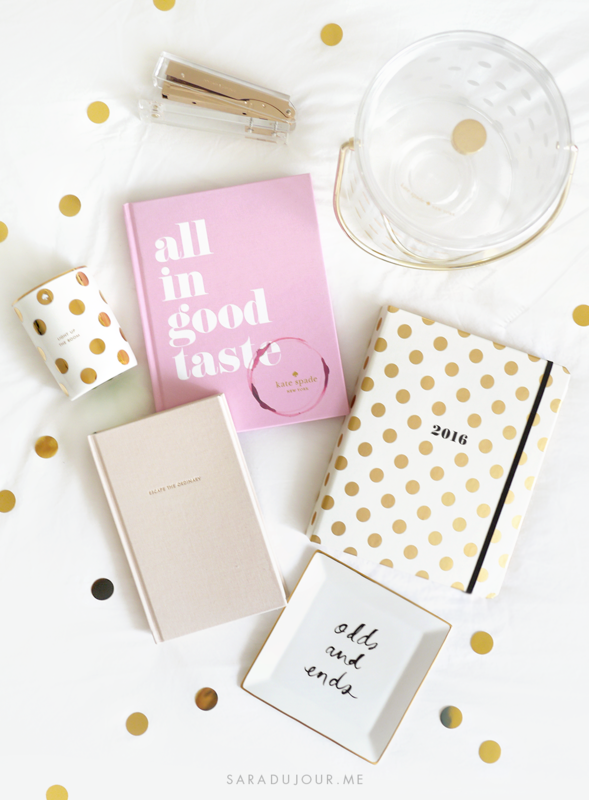 I keep it on my bedside table to stay organized, making to-do lists upon to-do lists. Isn’t checking things off so satisfying? And lastly, on Christmas Day I got to unwrap the candle that has been on my wish list for over a year! You might be able to guess why I love it so much…it might have something to do with gold dots. It’s described as being “fig scented” online, but to me it smells like a hint of fig mixed with some stronger pine or spruce notes. It’s on my bedroom windowsill now, and I love it so much I might never actually burn it. All of these look so incredibly cute! I want everything!